A breathtaking video shot at the MAKS 2017 Air Show near Moscow shows the legendary ‘Russian Knights’ aerobatic team performing stunts in their Sukhoi Su-30 fighters. An RT video crew, together with pilot and aerial photographer Artur Sarkisyan, installed panoramic cameras on both the interior and exterior of the SU-30SM fighter jets to capture a stunning 360-degree view of the jets soaring above the clouds and performing head-spinning maneuvers such as loops, rolls and flying in formation. The moves were carried out by the renowned ‘Russian Knights’ team, who have performed at air shows all over the world including LIMA 17 in Malaysia and the Bahrain International Air Show. The Knights were also due to perform over the Victory Day parade in Moscow in May, but unfortunately the show was canceled due to the weather. The MAKS 2017 International Aviation and Space Salon opened in the Russian city of Zhukovsky outside Moscow on Tuesday, at the airfield of the Gromov Flight Research Institute – one of Russia’s top aviation centers. 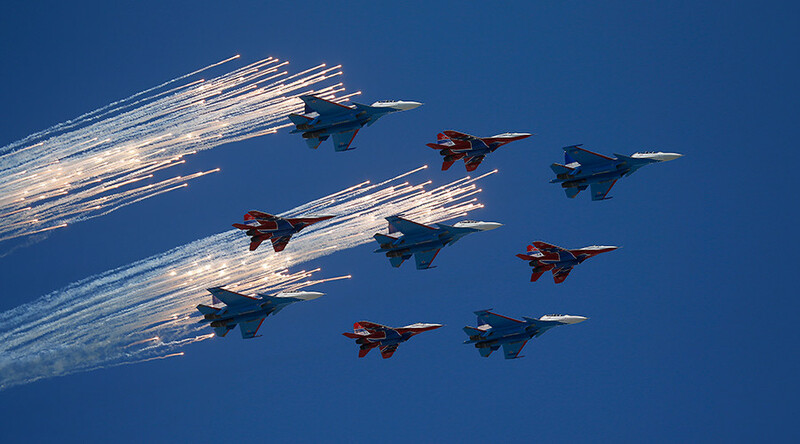 The air show is meant to demonstrate Russia’s aerial capability to the rest of the world, as well as provide a forum for top aviation officials and industry representatives.